Whole foods skin care lines, motherhood has brought so many things to light. I became a bit fanatical about the products we bought. And because my husband has a melanoma, I am looking for products that are safe and free of chemicals in our skin, that works too! Natural beauty has become a priority in my life. 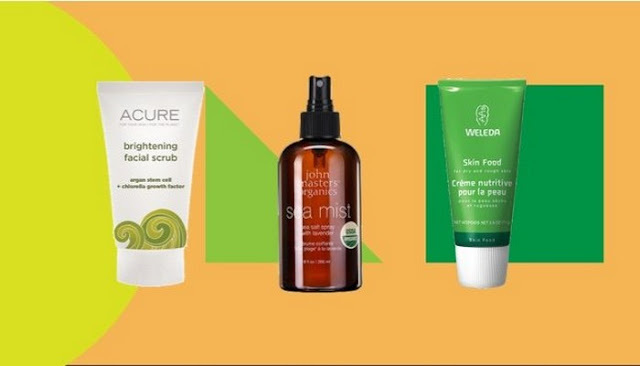 Whole Foods sent some of their favorite natural products in preparation for their fourth annual Beauty Week (March 21-28). To tell the truth, I did not even know they did such a thing. But I think it is an excellent way for people to try out a number of natural products without going through the bank. During Beauty Week they offer a 25% discount on beauty products such as makeup, face care, nail care, hair care and make-up brushes. This is a good time to try the products you have viewed for a reduced price. After buying some products, I will definitely buy the beauty bag! I wanted to share some of the products I sent because I tried them in the last two weeks and found some winners. First, there is the blue moisturizer from Cactus Beauty Elixir and Rose Vetiver for evanhealy. The box recommends using these products together, and that's what I did. I used them on the days when I applied makeup to moisten my face a bit. I noticed that my skin remained hydrated all day without making the fat. These are excellent products to use in these dry winter months! This trio is the soothing cleansing milk, daily cleansing oil and Dr. Hauschka's Night Time. I have never used any of these products, but I have found the greatest success with them. The soothing makeup milk was a great makeup remover, but I felt it made my skin a bit greasy. I would recommend Cleansing Milk and Night Serum for people struggling with dry skin. The night that I like! It feels like jello, if you use it, and the next morning I noticed a big difference in my skin. I will use it for a while to see if it still helps with my dry skin and fine lines. This hydrating sleep team is the Weleda Almond face cream and a cucumber hazelnut toner with Thayers Aloe Vera! I decided to try these products on the days when I did not use make-up to help, breathe and hydrate my skin. This was the first time I used a gentleman in front of my face, and I really enjoyed it. I think it would help a lot more in the summer when I'm looking for a refreshing effect, but it's a product that I would definitely buy. The almond face cream has worked well for my skin. I think it's great that it does not contain any odor and is suitable for sensitive skin. I got a few pretty bad outbursts during a certain time of the month and that did not irritate my face at all. We have the Burt's Bees Berry and the Mineral Fusion Volumizing Mascara lipstick. When I opened the box, I saw Burt's Bess lipstick, I was so excited to share this product. I already have a number of these in different colors and I swear by them. They keep my lips hydrated all day and have a nice pigment. When I apply the lipstick again, the existing product is not removed, but is added to the pigment. As far as the mask is concerned, I have been using it for a few days with ease. I love how it does not accumulate and gives your eyelashes a natural look. I would say that it is a great natural mask in your make-up kit. And finally we have some of my favorite masks! The Andalou Instant hydration mask, the Andalou Instant Lift & Firm mask and the Hydrogel rejuvenation mask under the Acure eye. I have used all three in the past and I LOVE them. I use the Andalou drinking mask constantly after a mud mask. The Sirum moisturizes my skin without pulling the rest of my skin. It really feels like a mini facial treatment at home! There you have friends! Whole Foods clearly has a number of excellent natural products to choose from. You can do the same if you are interested. I am not actively looking for the commercial side. I am enthusiastic about my work and I am immersed in various projects. However, if you also like some products that I highlight here, do not hesitate to contact me. I can help you buy them from me or another consultant, or you can sign up like me. There are many Arbonne products that I have not tried yet. So, if you've tried something and have favorites, please share them. I would also like to learn from you! RE9 extra moisturizing day cream with SPF 20 This is the one I use daily with my sea-buckthorn oil in the morning after showering. It has a pleasant texture and does not smell like perfume. Advanced Renewal Serum RE9. This product should be used twice a day under a moisturizer.